The next big thing in email productivity: Atrendia LeanMail. Complete control over messages, priorities, and tasks. With Atrendia's LeanMail tools, methods, and mindset, your employees will get their inboxes under control and immediately become more productive in your organization's core business. A 95% adoption rate. The LeanMail tools are taught in a training process so effective that, twelve months after training, more than 95% of participants report they're still using and benefiting from LeanMail. LeanMail is based on years of research into what knowledge workers need to reduce the time and energy spent in email while increasing their focus on critical results and tasks. Atrendia's software add-in for Outlook is powerful but simple and elegant. It enables employees to do everything they've always needed to do with email in just two steps. The add-in works with every version of Outlook, employees learn how to use it in less than 15 minutes, and installation takes just seconds — all without any changes to your Exchange server. Most training is of the "hit-and-run" variety, with the instructor getting out of town before anyone realizes that employee behaviors have not changed. LeanMail training, by contrast, takes into account the strength of stubborn habits and carefully targets new habits: concepts are taught in manageable chunks and then followed up with weekly coaching sessions, which both monitor each individual's level of adoption and clear away any misunderstandings or misapplications of the tools. But that's not all: The progress of each individual is measured over the course of the year through surveys, so that those requiring more attention can receive it — all of which explains why LeanMail has a 95% adoption rate. Atrendia's LeanMail is the ideal complement to Email Excellence. Its tools and methods can transform your organization's productivity in email. Joann Canaday, Human Resources Director, Sodexo North America: I am so happy I went through this training. It has transformed my work life. I feel less anxiety about my email inbox and have been so productive. I love Atrendia! Kasper Hansen, Finance Officer, Mannaz A/S: When I heard about LeanMail and how it would help me get control of my inbox, I must admit, I was a bit skeptical. 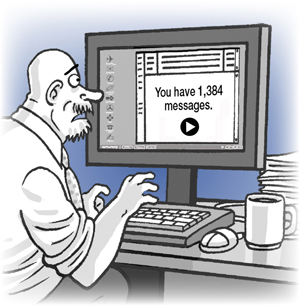 But after using it for some weeks, I realized that before LeanMail, I was not in control of my inbox. I am now... and it feels great. How our training can work for you. Free writing tools. Email samples and writing tools you can put to immediate use. Our Email Leadership blog. This blog addresses email productivity from a management perspective.